A homily is a speech or sermon given by a priest in a Roman Catholic Church after a scripture has been read. The purpose of the homily is to provide insight into the meaning of the scripture and relate it to the lives of the parishioners of the church. A homily may also be a long speech given by a lay person to teach a moral lesson. Homilies are given during traditional mass but also during any other mass such as at a wedding, baptism or funeral. 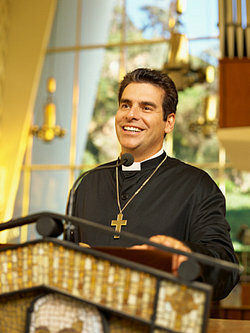 There are various techniques a priest will use to effectively convey his message during a homily. Often during a homily the priest will use his own experience to help listeners to understand the meaning of scripture or the purpose of his homily. "Perhaps many of you grew up during the depression. If so, you know what it means to be poor. I did not grow up during the depression, but I grew up in a poor family. I can remember one Christmas when both of my parents were out of work, and we had no money. Concerned parishioners brought Christmas baskets to our house. It was a humbling and difficult experience for my parents. The year before, my father had helped to distribute baskets to other poor people. Now it was our turn." "One of the central beliefs of Christianity is that Jesus will return in glory. In spite of the fact that the Gospels tell us we do not know the day or the hour, some Christians decorate their automobiles with signs that declare "Jesus is Coming Soon!" It seems to me that we spend far too much time concentrating on this. Someday Jesus will return and the end will come. However, it does not really matter when that will happen--whether it is soon or centuries from now. What really matters is how we get there--what we do with this life." Homilies from Churches Throughout the U.S.
"There is a fable that tells of three apprentice devils who were coming to earth to finish their apprenticeship. They were talking with Satan, the chief of the devils, about their plans to tempt and to ruin humanity. The first said, "I will tell them there is no God." But Satan said, "That will not delude many, for they know there is a God." The second said, "I will tell them that there is no hell." Satan answered, "You will deceive no one that way, they know even now that there is a hell for sin." The third said, "I will tell them that there is no hurry." "Go," said Satan, "and you will ruin people by the thousands." The most dangerous of all delusions is that there is plenty of time." "He must increase, but I must decrease (John 3:30). Those simple, direct words of St. John the Baptist, whose feast we celebrate today, summarize the life of the Christian disciple. In all things, we want Jesus to increase and our own will, our own desires, our own attachments, to decrease. In my heart, in my prayer, in my family, in my parish, in my work, in my study, in my leisure, in my entertainment - may the Lord Jesus increase!" "Tonight I would like to outline for you the basis for Catholic involvement in and attention to the migration of peoples and explain how the Church engages this global phenomenon here in the United States of America. We first look to the Gospels as a foundation, where the migration of peoples is a common thread throughout both the Old and New Testament. In Exodus, we see the flight of the Israelites, who flee the oppression of Egypt and wander in the wilderness for forty years, until the Lord leads them to a new home, Israel. This experience leads to the Lord's admonishment to the Israelites in Leviticus: "When an alien resides with you in your land, you shall not oppress the alien. The alien who resides with you shall be to you as the citizen among you; you shall love the alien as yourself, for you were once aliens in the land of Egypt: I am the Lord your God" (Leviticus 19:33-34). There is no equivocation in that statement." These examples of homilies and homily subjects could have just as easily been given by a priest or lay person. "Examples of Homily." YourDictionary, n.d. Web. 23 April 2019. <https://examples.yourdictionary.com/examples-of-homily.html>.